Luca Signori and his wife and two kids were Costa’s one millionth passengers this year. They are shown here aboard their cruise on Costa Fortuna which earned them the status. To celebrate, the Signoris were guests of honor at a gala held at Genoa’s Palazzo Ducale, and they have been awarded a free 7-night cruise to Greece and Turkey aboard Costa Serena, the line’s flagship. Costa is the first European line to carry a million passengers in one year, but they aren’t stopping there. Their next goal is to be carrying 1.5 million passengers annually by 2010. When Regal Princess starts her new life in Australia, she will get a new name, Pacific Dawn. With the new name she will have a new godmother to christen her with it. Australian athlete Cathy Freeman has been chosen to do the honors in a ceremony on November 8. The ink on the press release about Cunard building a replacement for QE2 wasn't even dry yet yesterday, when Liverpool was already putting in their bid to host the christening ceremony in the fall of 2010. The Liverpool Echo reports that the city had made pitches to Cunard about hosting those for QM2 and Queen Victory, but was passed over in favor of Southampton. This time, Liverpool wanted to make sure they were first in line. The Echo quotes Cunard president Carol Marlow as saying Cunard will consider it. Reuters reports that scrapping has begun at Alang (India) on the 46,000-ton Blue Lady which is Norwegian Cruise Line's former SS Norway and SS France prior to NCL's purchase of the classic liner. The ship has been at the center of protracted legal battles due to the amount of asbestos it is believed to contain. Nonetheless, according to the Reuters article, the workers at Alang are happy for the work, saying they would rather risk death while working than starve to death due to lack of work. The ship was severely damaged by a boiler explosion, and after months of negotiating with the insurance company, NCL and Star Cruises decided to sell the ship since it became evident that it would not be economically feasible to repair it for use again as a cruise ship. NCL spent months trying to find a buyer for the ship with a workable plan for another use of the ship. When one couldn't be found, the ship was transferred to Star which worked on their own plan for an alternate use for the ship. When a buyer stepped forward during that process, Star made the decision to sell the ship. NCL told CND at the time of the transfer to Star that they had removed the important artifacts from the ship and placed them in storage for future use. There's been an open secret in the cruise industry for a long time. Companies have marketed "credentials" to allow individuals to become "travel agents" and supposedly receive free or discounted travel. Most of the people who buy into this are only interested in travel benefits and have no interest in actually selling travel, except possibly a trip here or there to a friend or relative. The companies who sell these credentials which they create are usually only really interested in collecting the fee from the individual, which is usually several hundred dollars. The cruise lines and other travel suppliers make their products available to travel agents at a discount so their sales force can see their products first-hand. When these bogus "travel agents" travel, not only does it beat the supplier out of their full revenue, but it also takes up space legitimate travel agents could be using properly. For years, the industry has attempted to deal with this, but has been unsuccessful for several reasons. Today, Royal Caribbean has taken matters into their own hands. One of the problems faced by the industry is that a few of the individuals who bought into the program would actually intend to be part-time travel agents. In most cases, it's impossible to determine who those people are, because all the travel is booked under the main agency's name, and the suppliers have no information about which individual "agents" have actually made bookings. Royal Caribbean has cut to the chase. They've begun terminating their business relationships with the travel-related companies they unilaterally have determined are "card mills" (i.e. providing ID cards to individuals primarily for the purpose of discounted travel). With them will go all their "agents." Royal Caribbean says this will affect well over a hundred thousand people they believe have bought into these schemes. In addition to protecting their bottom line, Royal Caribbean sees the action as protecting the consumer and their legitimate travel agents. Few of the "agents" of these companies have had any training or real product knowledge, and for those who are selling Royal Caribbean, the company doesn't want their brands' products misrepresented to the consumer. They also said these people are not providing the full set of services they expect a travel agent to provide consumers thus shortchanging the consumer of what they would get from one of their legitimate travel agents. Royal Caribbean said the process has just begun, and it will be an ongoing program to identify the "card mills" and sever the relationships. This article appeared in Cruise News Daily's October 9, 2007 edition. Since its inception, Southwest Airlines has marched to its own drummer. They have their own procedures that work for them and are nonstandard in the airline industry. Consequently they get left out of many programs within the industry simply because they operate so differently. One thing they have in common with other airlines serving Florida, however, is that they carry a lot of cruise passengers. One of those programs they have been left out of is the cruise industry's that offers passengers advance check_in for their return flight and takes luggage from the ship right to the airport. Southwest has now devised its own remote check-in plan to help ease congestion at its ticket counter at Ft. Lauderdale on cruise days. The Miami Herald reports that troubled Windjammer Barefoot Cruises has canceled two more weeks of cruises, October 14 and October 21. The bright spot, if there is one, is that at least Windjammer seems to have communicated with someone. In recent weeks, passengers, crew members and media have reported being unable to elicit responses from anyone at Windjammer's corporate offices. Beyond the new cancellation dates, however, the promises of new investors and return to normal service "shortly" sound like those that we've heard from dying cruise lines in the past. Picking up people on rafts in the Florida Straits isn't really anything unusual, but in the Mediterranean, it doesn't happen as often. We received the statement below from MSC Cruises just now detailing one of those occasions last week. There was no indication of exactly why the people were out at sea in the small boat. (Oct. 8, 2007) – MSC Cruises announced that around midnight on Oct. 3, MSC Lirica was traveling between Malaga and Civitavecchia, roughly three hours southeast of Cartagena [Spain], when the crew sighted a small boat in difficulty asking for assistance. The Spanish authorities, the Cartagena Rescue Centre and the local DPA were advised while MSC Lirica’s Rescue and Security teams helped the nine Algerian citizens on board the cruise ship. The castaways were in frail condition; in fact, one needed urgent medical attention. They were assisted and given refreshments. MSC Lirica, in accordance with the local authorities and the DPA, then turned back toward Cartagena. At 2:40 a,m, the ship met the rescue boat Salvamar Alcor, accompanied by the coast guard vessel, and handed the nine castaways over to the authorities. By 3 a.m. the operation was completed and MSC Lirica resumed her course to Civitavecchia. Remember the days when going to training meant some time out of the office and flying, maybe, to some interesting interesting city for a couple of days? 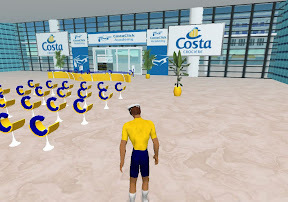 Thanks to the internet, you no longer get to travel anywhere, let alone have any time out of the office for training - and Costa Cruises is set to take full advantage of the latest in internet technology to train their travel agents in a way most agents probably haven't seen yet. For those readers unfamiliar with Second Life, the company describes itself as "a 3D online digital world imagined and created by its residents." It's hard to describe if you don't understand, but when you sign up, you create a digital representation of yourself, and you walk around and do things and "buy" virtual things there with virtual money. How do you get the money? Well, you start out by "buying" some with real money that you give Second Life. There are zillions of members around the world. For example, this afternoon at about 2pm Eastern time, there were almost 46,000 people from around the world logged on, and in the last 24 hours, they had spent more than $1.1 million. Second Life has become so ubiquitous that real companies are starting to do real business there. NBC News, for example, will be participating in a job fair there. Likewise, Costa has set up their Palacrociere cruise terminal there, and as we mentioned, has created a classroom in the "building" (above) and will actually be holding classes there where real travel agents will learn about their real product and booking engine. At the end of the class, agents will be able to walk around the digital model of the cruise ship Costa has built in Second Life. Now if you are ready to expand your mind, think about this: At some point, will Costa be selling virtual cruises on that ship? (for virtual money, which of you have earned in Second Life or acquired by paying real money) And if you go, will you enjoy yourself and come back relaxed? How will the spa thing work? Will the therapist in the spa try to sell you virtual products, and how will you use them? Maybe I just don't get this, but the agent training part sounds cool. Remember Louis Cruises' Sea Diamond which sank at Santorini last April? It's still down there, in tact, slowly leaking oil and being kept tabs on by local authorities. The AP reports that a Greek diver died Saturday while inspecting the site of the Sea Diamond's wreck as part of the official investigation. The ship struck some rocks and began taking on water. After almost 1,600 passengers were safely evacuated, it sank suddenly early the next morning. Two passengers were unaccounted for and presumed dead, although there are some still-unresolved questions as to if they were actually on the ship. The 44-year-old diver was part of dive team video taping the site and inspecting for oil leakage and other evidence as to the cause of the sinking. The Kathimerini reports the possible cause of his death is that he surfaced too quickly, but an autopsy will be performed to determine the official cause of death. Liverpool's new cruise ship dock opened to great fanfare less than three weeks ago when QE2 called at the port, and yet it's disappearing - temporarily. There's nothing wrong with the floating pier, but there need to be tests conducted for Lloyd's register. The tests would normally have been done prior to its opening, but there was a rush so the facility would be completed in time for QE2's visit. Several of the floating pontoons will be detached and taken to the Cammell Laird yard for certification by Lloyds. There's an interesting story about the process in the Liverpool Echo. There are also links on the page to some interesting video and photos of the facility.